Julia Domna (AD 160–217) was a Roman empress of Syrian origin, the second wife of Septimius Severus (reigned 193–211). She was born in Emesa (present day Homs) in the Roman province of Syria, into a family of priests of the deity Elagabalus. As a powerful political figure and member of the imperial family, Julia received titles such as "mother of the army camps". She was famous for her political and philosophical influence. After Severus' death in 211, his two sons with Julia, Geta and Caracalla, ruled jointly over Rome. Caracalla had Geta assassinated later that year. Julia continued to have a powerful role during the reign of Caracalla. Julia is thought to have committed suicide in 217 upon hearing of the assassination of Caracalla. After her death, her older sister Julia Maesa successfully contended for political power. Julia Domna was born in Emesa (modern day Homs) in Syria around 160 AD to a family of Arab descent. Her name, Domna, is an archaic Arabic word that means black. She was the youngest daughter of the high-priest of Ba'al Gaius Julius Bassianus and sister to Julia Maesa. Through her sister and Maesa's husband Julius Avitus, Julia Domna had two nieces: Julia Soaemias and Julia Mamaea, the respective mothers of future Roman emperors Elagabalus and Severus Alexander. Julia's ancestors were priest kings of the famous temple of Elagabalus. The family had enormous wealth and was promoted to Roman senatorial aristocracy. Before her marriage, Julia inherited the estate of her paternal great-uncle Julius Agrippa, a former leading centurion. In the late 180s, Julia married the Libyan Roman general Septimius Severus. The marriage proved happy, and Severus cherished Julia and her political opinions, since she was very well-read and a student of philosophy. They had two sons, Caracalla (Lucius Septimius Bassianus) in 188 and Geta (Publius Septimius Geta) in 189. 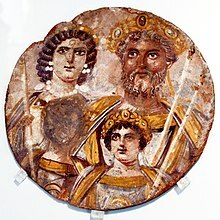 After the Roman emperor Commodus was murdered without an heir in 192, many contenders rushed for the throne, including Julia's husband, Septimius Severus. An elder senator, Pertinax, was appointed by the praetorian guard as the new emperor of Rome. But when Pertinax would not meet the guard's demands, he too was murdered. Another politician, Didius Julianus, was called to Rome and appointed emperor. Severus, coming from the north into Rome, overthrew Julianus and had him executed. Severus claimed the title of emperor in 193. By offering Clodius Albinus, a powerful governor of Britannia, the rank of Caesar (successor), Severus could focus on his other rival to the throne, Pescennius Niger, whom he defeated at the Battle of Issus in 194. When afterwards Severus declared openly his son Caracalla as successor, Clodius Albinus was hailed emperor by his troops. At the Battle of Lugdunum in 197, Severus defeated and killed Albinus, establishing himself as Emperor. Thus Julia Domna became Empress consort. Unlike most imperial wives, Julia remarkably accompanied her husband on his military campaigns and stayed in camp with the army. During this time, honorary titles were granted to Julia similar to those given to Faustina the Younger, including mater castrorum, mother of the camp, mater Augustus, mother of Augustus, and mater patriae, mother of the fatherland. The empress was involved in building projects, most notably the aedes Vestae after the fire of Commodus in 192 destroyed areas of the temple and the home, or Atrium, of the Vestal Virgins; based on numismatic evidence, historical authors, and a laconic inscription found in situ, some scholars agree that Julia funded restorations to the site during Septimius Severus's reign. Julia was respected and viewed positively for most of her tenure, as indicators and evidence include the coins minted with her portrait, mentioning her with several honorary titles and also simply as "Julia Augusta". Julia is said to have exceeded all other Roman empresses in titles and honours. The hairstyle that she used would later be worn by Roman empress Cornelia Salonina and Palmyran queen Zenobia. When Severus died in 211 in Eboracum (York), Julia became the mediator between their two sons, Caracalla and Geta, who were supposed to rule as joint emperors, according to their father's wishes expressed in his will. The two young men were never fond of each other and quarrelled frequently. Geta was murdered by Caracalla's soldiers in the same year. Geta's name was then removed from inscriptions and his image was erased. During his campaign against the Parthian empire in 217, Caracalla was assassinated by a Roman soldier. Julia chose to commit suicide after hearing about the rebellion, perhaps a decision hastened by the fact that she was suffering from breast cancer, as well as a reluctance to return to private life. Her sister Julia Maesa restored the Severan dynasty about a year after Julia Domna's death. Julia Domna's body was brought to Rome and placed in the Sepulcrum C. et L. Caesaris (perhaps a separate chamber in the Mausoleum of Augustus). Later, however, both her bones and those of Geta were transferred by Julia Maesa to the Mausoleum of Hadrian. Julia Domna is remembered for encouraging Philostratus to write the Life of Apollonius of Tyana. Julia is thought to have died before Philostratus could finish his work of eight volumes. Burns, Jasper (2006). Great Women of Imperial Rome: Mothers and Wives of the Caesars. Routledge. ISBN 978-1-134-13184-6: "The date of Julia's birth is not known, but coins of her sister Julia Maesa, minted about 220, show a woman nearing 60 (see figures 11.2, 11.17). Thus Julia Domna was probably born around 160." Gagarin, Michael (2010). The Oxford Encyclopedia of Ancient Greece and Rome. Oxford University Press. p. 3. ISBN 978-0-1951-7072-6. Bowman, Alan; Garnsey, Peter; Cameron, Averil (September 8, 2005). The Cambridge Ancient History: Volume 12, The Crisis of Empire, AD 193-337. Cambridge University Press. p. 502. ISBN 978-0-521-30199-2. Ball, Warwick (June 10, 2016). Rome in the East: The Transformation of an Empire. Taylor & Francis. p. 769. ISBN 978-1-317-29634-8. Bowersock, Glen Warren (1994). Roman Arabia. Harvard University Press. p. 128. ISBN 978-0-674-77756-9. Shahîd, Irfan (1984). Rome and the Arabs : A Prolegomenon to the Study of Byzantium and the Arabs. Dumbarton Oaks Research Library and Collection. p. 167. ISBN 0-88402-115-7. Bowersock, Glen Warren (1994). Roman Arabia. Harvard University Press. pp. 126–128. ISBN 978-0-6747-7756-9. Rodinson, Maxime (1981). The Arabs. University of Chicago Press. p. 55. ISBN 978-0-2267-2356-3. ^ a b Levick, Barbara (10 May 2007). Julia Domna: Syrian Empress. Routledge. p. 18. ISBN 978-1-134-32351-7. ^ Birley, Anthony (1999). Septimius Severus: The African Emperor, Routledge, p. 76-77. ISBN 0-203-02859-7. ^ Rahman, Abdur (2001). The African Emperor? The Life, Career, and Rise to Power of Septimius Severus, MA thesis. University of Wales Lampeter. ^ Birley, Anthony (1999). Septimius Severus: The African Emperor, Routledge, p. 89-128. ISBN 0-203-02859-7. ^ 1889–1943., Collingwood, R. G. (Robin George), (1998) . Roman Britain and the English settlements. Myres, J. N. L. (John Nowell Linton). [New York, N.Y.]: Biblo and Tannen. ISBN 0819611603. OCLC 36750306. ^ "Julia Domna 170 CE Syria". Women-philosophers. Archived from the original on 30 May 2012. Retrieved 6 March 2014. ^ a b Levick, Barbara (2007). Julia Domna: Syrian Empress. Routledge. p. 66. ISBN 9781134323517. ^ Bernario, H. W. (1958). "Julia Domna: Mater Senatus et Patriae". Phoenix. 12: 67–70. ^ Lindner, M. M. (2015). Portraits of the Vestal Virgins: Priestesses of Ancient Rome. Ann Arbor, MI: University of Michigan Press. ^ Southern, Pat (2 August 2018). Empress Zenobia: Palmyra's Rebel Queen. Bloomsbury Publishing. p. 119. ISBN 978-1-441-17351-5. ^ Goldsworthy, Adrian (2009). How Rome Fell: death of a superpower. New Haven: Yale University Press. pp. 68–69. ISBN 978-0-300-16426-8. ^ Dunstan, William E. (2011). Ancient Rome. Lanham: Rowman and Littlefield. pp. 405–406. ISBN 978-0-7425-6832-7. ^ Goldsworthy, Adrian (2009). How Rome Fell: death of a superpower. New Haven: Yale University Press. pp. 70–71. ISBN 978-0-300-16426-8. ^ Goldsworthy, Adrian (2009). How Rome Fell: death of a superpower. New Haven: Yale University Press. p. 74. ISBN 978-0-300-16426-8. ^ a b Jones, Christopher P. (2005). Philostratus, The Life of Apollonius of Tyana. Harvard University Press. p. 2. ^ Birley, Anthony (1999). Septimius Severus: The African Emperor, Routledge, p. 192. ISBN 0-203-02859-7. ^ Potter, David S (2004). The Roman Empire at Bay AD 180–395, Routledge, p. 148. ISBN 0-415-10058-5. ^ Salisbury, Joyce E. (2001). Encyclopedia of Women in the Ancient World. ABC-CLIO. p. 183. ISBN 9781576070925. ^ Burns, Jasper (2006). Great Women of Imperial Rome: Mothers and Wives of the Caesars. Routledge. p. 209. ISBN 9781134131853. ^ "Cassius Dio — Epitome of Book 79". University of Chicago. Archived from the original on 2012-05-26. ^ Dzielska, Maria; Stucchi, Sandro (1986). Apollonius of Tyana in Legend and History. p. 14. ISBN 88-7062-599-0. Wikimedia Commons has media related to Julia Domna. Minaud, Gérard (2012). Les vies de 12 femmes d'empereur romain: devoirs, intrigues & voluptés (in French). Harmattan. pp. 211–242. ISBN 978-2-3360-0291-0. Fejfer, Jane (2008). Roman Portraits in Context. Walter de Gruyter. ISBN 978-3-1101-8664-2.